Mljet is an eight largest island of the Adriatic sea and one of the most indented. It is situated near wondrous city of Dubrovnik and it has been inhabited since ancient Greek times. 70.6% of surface of the island is covered by forest and that is why Mljet is also called "the green island". Because of particularly attractive landscapes of the western part of Mljet that area (about 1/3 of the whole area) was declared a National park in 1960. Interesting note: Time magazine places island of Mljet among 10 most beautiful islands of the world. Jacques Cousteau considered this part of Adriatic as one of the world's most beautiful diving locations. Photos of Mljet, Korcula, Dubrovnik and Peljesac. Blace beach (photo courtesy of www.villa-hansal.com) is located in the most beautiful sandy bay at the very southeastern end of the island. It takes a twenty minutes of walk to get there from a small village called Saplunara where you can stay in private accommodation. Recently a new asphalt road has been constructed all the way from Saplunara to near Blace. At the end of the road you can park your car and from there are exactly 187 steps to the beach. Isolated and away from populated places, Blace beach faces south and open sea, but still is shielded by low cliffs. Beach is nearly 1 km long, surrounded by coronet of centenary pines and presents a shining example of primordial intact nature. This is not an official naturist beach and it is used by both naturists and textiles. 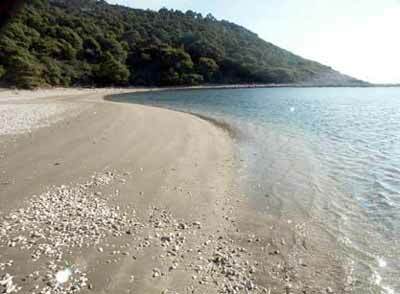 There aren't any official naturist beaches on the island of Mljet and none of the beaches is marked as one. But the island offers hundreds of lovely, little pebble stone coves and bays, many of them reachable only by boat, where you can be undisturbed and enjoy total privacy for a day. Also, in the area near to the Atlas Hotel Odisej (Odyssey) has been used by naturists, but can suffer from an influx of tourists visiting the salt water lakes. This hotel is located in Pomena village in the heart of the National Park Mljet.